Zara Jewelry Joining Indie Craft Market! This Sunday, April 21st, I’ll be joining other D.C. area artists for the First Annual Indie Craft Market, presented by Gala Artisan Jewelry & Gifts in coordination with CREST Artisans (Capitol Region Etsy Street Team). The show will include a variety of mediums including jewelry, photography, fine art, textiles, cards, clothing and accessories. Located in charming Kensington, Maryland, the Indie Craft Market coincides with the Kensington Day of the Book Festival. It’s sure to be a fun day – stop by and say hello! Welcome to the Zara blog! My name is Sarah – and I enjoy sharing and connecting with fun and interesting content, links, images, and the latest in the Zara collection. Be sure to say hello and introduce yourself – and if you have any questions, please visit the CONTACT page and shoot me a message. Cheers! Zara Jewelry at Washington National Cathedral Flower Mart! 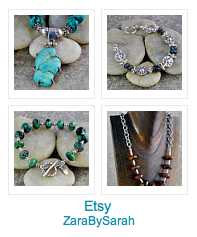 This holiday season, buy handmade! Metalsmith. Shameless nerd. Lover of the sublime and absurd.